London: Manresa Press / Roehampton, S.W. Preface : Since writing the following pages six years ago . . .
Chapter I : The first sign of our approach to Lourdes was a vast wooden cross . 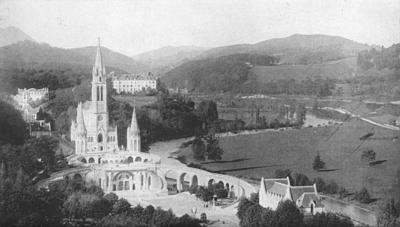 . .
Chapter II : We were in Lourdes again next morning a little after six o'clock . . .
Chapter III : Now, it is at the close of the afternoon procession that the sick more usually are healed . . .
Chapter IV : I awoke to that singing again, in my room above the door of the hotel . . .
Chapter V : After déjeûner I set out again to find the Scottish priest . . .
Chapter VI : I said a midnight Mass that night in the same chapel of the Rosary Church . . .
Chapter VII : In the afternoon we went down to meet a priest . . .
Chapter VIII : The moment Benediction was given, the room began rapidly to fill . . .
Chapter IX : Next morning I awoke with a heavy heart . . . The Blessing of the Sick. Imprimatur: Gulielmus F. Brown, Vicarius Generalis, Southwarcensi.